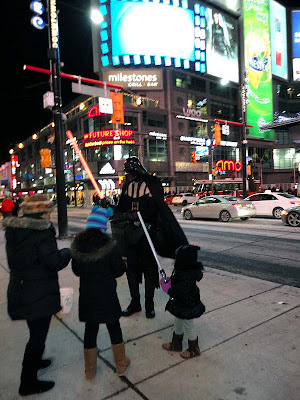 The loud hiss of Darth Vader's breath filled the air with dread around the #Toronto Eaton Centre as the evil genius looked for where he had parked his Death Star. His stormtroopers must have been searching high and low and thinking that the giant mall might have been the planet destroying space vehicle. 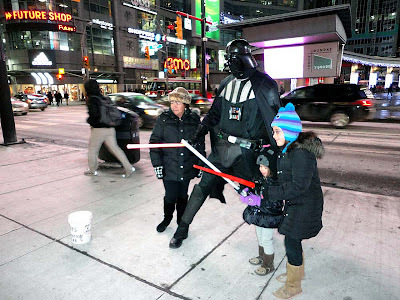 Left undefended the tall black sith lord, in helmet and cape, sought to influence the mind of people passing by and unsuccessfully he then posed with happy tourists. Instead of saying "The force is with you, young Skywalker, but you are not a Jedi yet" he says "tip me well my young Jedi". I had to leave when the light sabers slashed through the air, cleaving limbs and severing toes. Thank god he wasn't my dad.